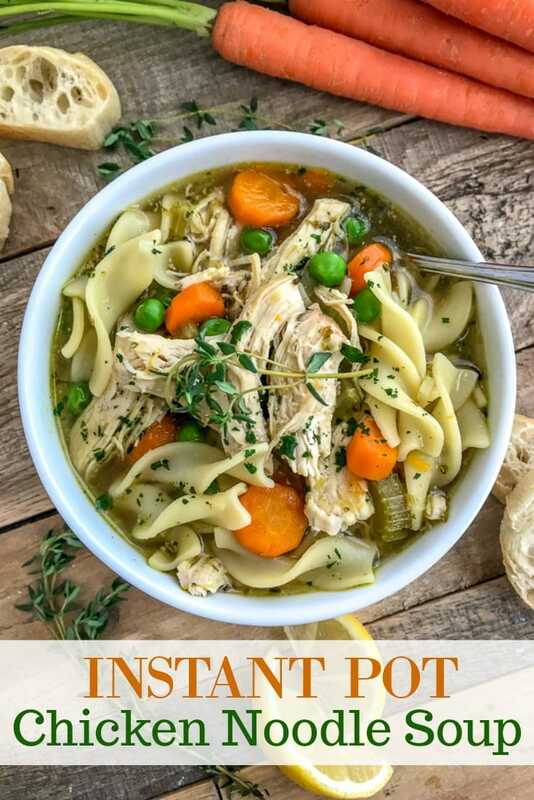 This Instant Pot Chicken Noodle Soup is the perfect healthy dinner option for those cold winter months or if you’re down and out with a cold! Easy to make, all comes together in one pot, and is full of flavor. 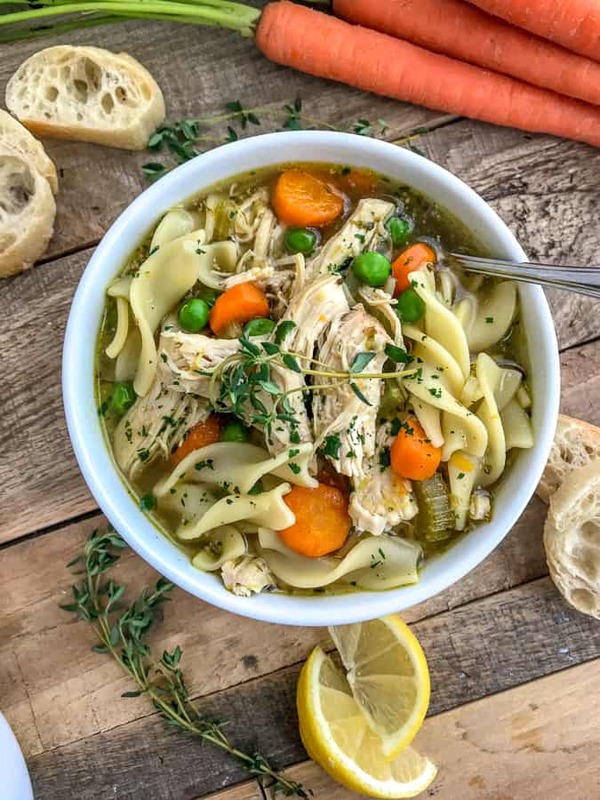 This classic, comforting homemade soup is loaded with tender bits of shredded chicken, vegetables, egg noodles and a bold chicken stock flavor. 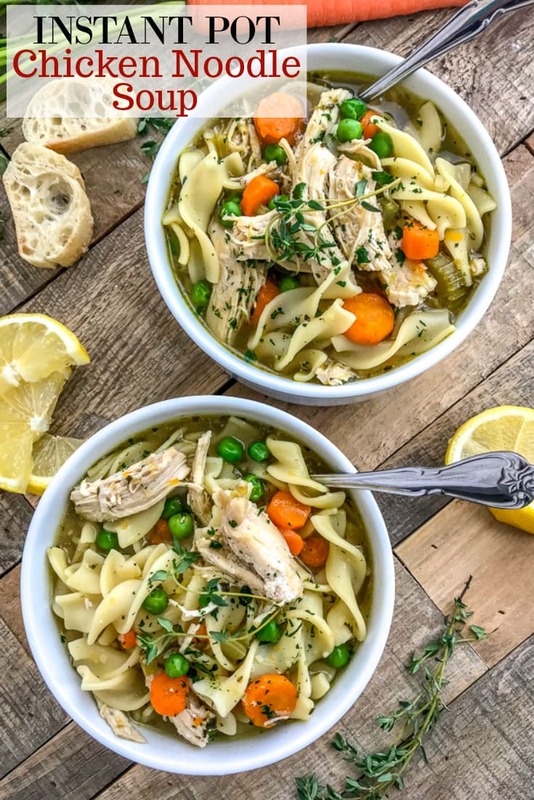 You will not miss the canned soup once you’ve tried this version! Is there anything in this world more comforting on a cold winter day than a hearty, warm bowl of soup? I think not! It is my go-to on these dreary, chilly days where I can’t seem to get warm. Or for those pesky colds that strike and take us down. It warms my soul to the core. So when I’m in need, I pull this recipe out. Or hopefully I have some stored in the freezer to make my day just a teensy bit easier. Especially when sick! Set the Instant Pot to sauté and add the olive oil. Once hot, add the onions, carrots, celery, and leeks. Cook 4-5 minutes, stirring every minute or so. Add in seasonings (minus the bay leaf) and minced garlic. Stir well, cook 1 minute. Deglaze the pot: pour in stock and stir, scraping along the bottom of the pot using a wooden spoon. Remove as many brown bits that you can. Add chicken breast, water, and bay leaf. Stir well. Place the lid on top, set the valve to the sealed position. Select Pressure Cook on HIGH for 7 minutes. Allow for a 10 minute natural release followed by a quick release. Remove the chicken from the pot to a cutting board. Hit cancel on the Instant Pot and select the sauté button. Once the soup has come to a boil, add the noodles and stir well. Cook 4-5 minutes, or until al dente. Remove the bay leaf and discard. Add in the lemon juice. While the noodles are cooking, shred the chicken using two forks. Return it to the pot, add the frozen peas and stir. 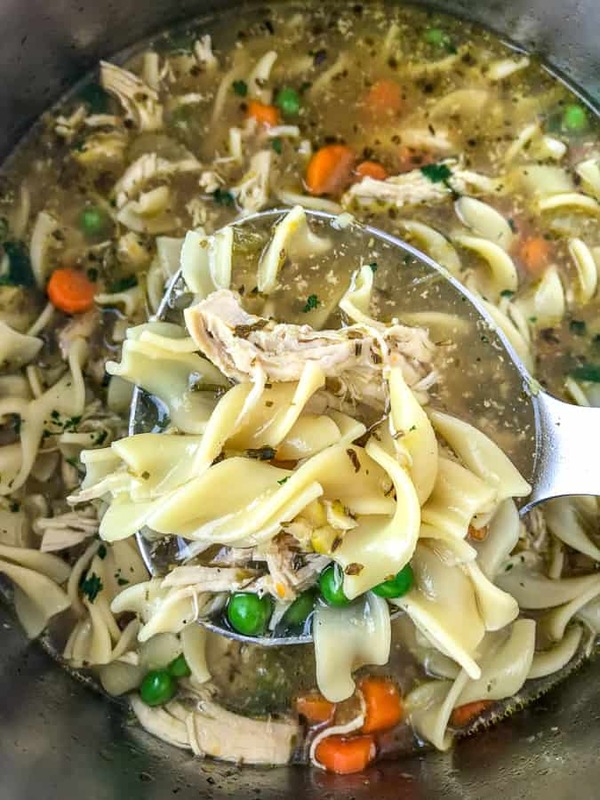 You can substitute chicken/vegetable broth for the chicken stock. Stock will have a richer, more profound flavor, though. This can be made on the stovetop! Directions are found below in the recipe card under the Instant Pot instructions. If you have cooked chicken on hand, add it at the end to warm. Lower the time on cooking to 4 minutes on HIGH. Don’t have some of the vegetables on hand? Get creative! Use mushrooms, zucchini, bell peppers, etc. This soup will keep 5-7 days in an airtight container in the refrigerator or up to 5-6 months in a sealed storage container in the freezer. 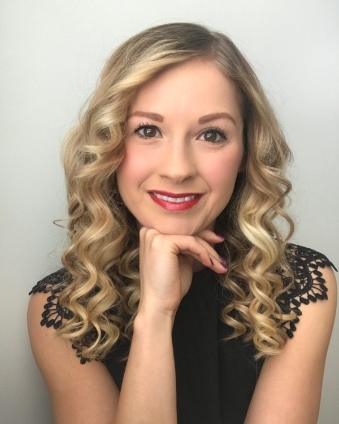 SODIUM: I prefer to buy and use any canned/boxed goods (such as broths and sauces) that do not have salt added to them, as I can control the amount of sodium in a recipe. If using regular stock/broth, season with salt accordingly. If using no salt added/low-sodium, increase the amount of salt, if desired. Instant Pot 6 Quart 7-in-1 Pressure Cooker – this is the exact pot I have and I LOVE it. Great for making soups or large meals to have leftovers for. Herb Scissors – you will thank me for this recommendation. I will continue to praise these scissors! Kitchen Tongs – these work great for gripping the chicken to safely remove it from the pot. Stainless Steel Ladle – self explanatory, no? Wooden Spoon and Scraper – to stir and deglaze/scrape the bottom of the pot for the brown bits! 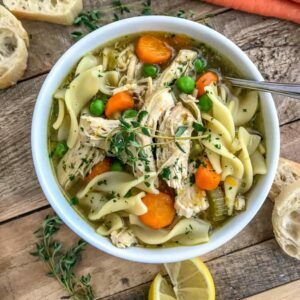 Simple and delicious soup that you and your family are going to love! 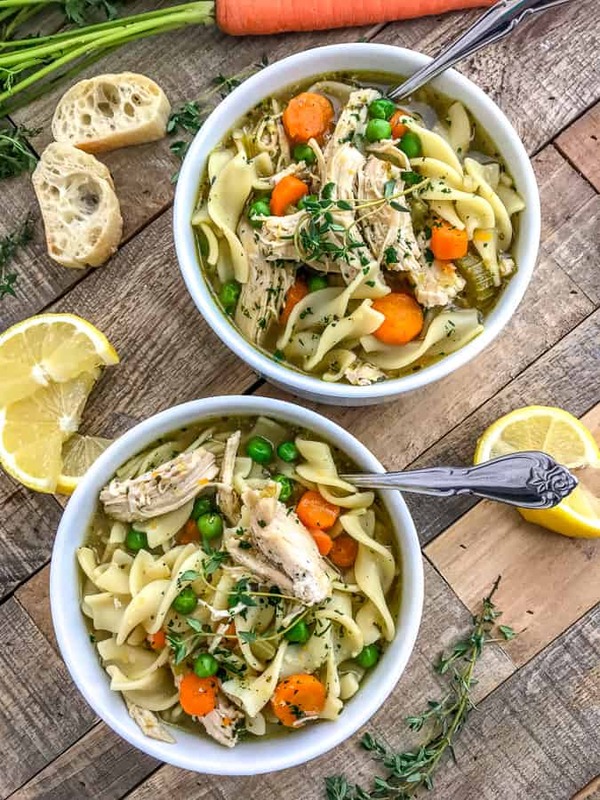 Loaded with juicy, tender chicken, pasta, tons of vegetables and an array of flavors. 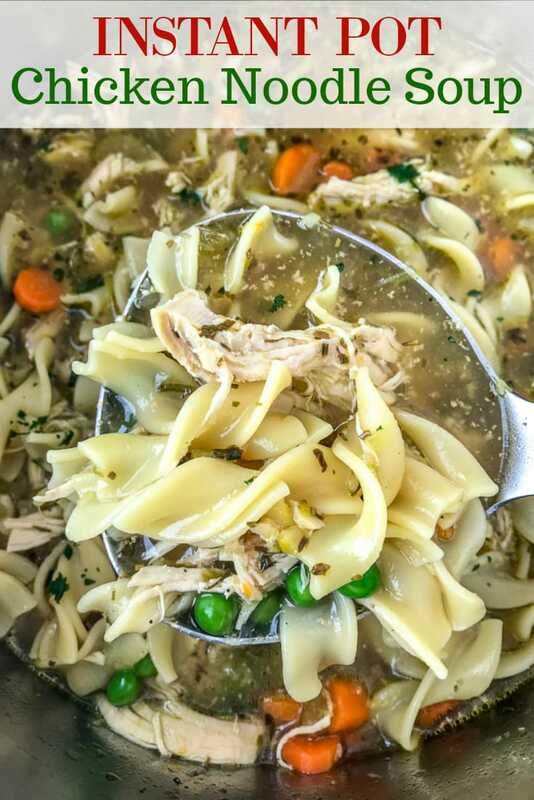 The ultimate soul soothing comfort dish during the chilly winter months! Set the Instant Pot to sauté and add oil. Once heated (you will hear a crackle/pop or two), add the onions, carrots, celery, and leeks. Stir and allow to cook 4-5 minutes. Add in the minced garlic and seasonings (minus bay leaf). Stir and cook 1 minute. To deglaze the pot: Pour in the chicken stock. Using a wooden spoon, stir and scrap along the bottom of the pot to remove any brown bits that were created from sautéing. This will help to prevent a "burn" notice. Add the chicken to the pot, water, and bay leaf. Stir well. Place the lid on, set the vent to the sealed position and the pot to Pressure Cook on HIGH for 7 minutes. It will take 8-10 minutes to come to pressure. After the timer has gone off, allow for a 10 minute natural release before doing a quick release to remove any remaining pressure that may be remaining in the pot. Remove the lid and, using tongs, carefully remove the chicken breasts to a cutting board. Hit cancel on the Instant Pot and select the sauté button. Allow the soup to come to a boil and add in the egg noodles. Stir and cook 5 minutes, or until the noodles are al dente. Remove the bay leaf. Add in the lemon juice (optional). Serve warm, garnished with parsley and your favorite crackers. Enjoy! Place a large soup pot over medium- high heat with olive oil. Once heated, add the celery, carrots, onions, and leeks. Cook 4-5 minutes, stirring occasionally. Add in the minced garlic and sauté for 1 minute. Stir well. Pour in the chicken stock and, using a wooden spoon, scrape along the bottom of the pan to remove any brown bits from sautéing. Season the chicken with salt and pepper (to taste) and add it to the pot along with the seasonings. Stir to mix well. Reduce the heat to medium low and cook for 10 minutes, or until the chicken is cooked through. The internal temperature should read 165 degrees F using a meat thermometer. Remove the chicken from the pot to a cutting board. Increase the temperature to medium-high. Add in the noodles and cook 4-5 minutes or until the noodles are tender. As the noodles are cooking, shred the chicken using two forks. Return the chicken to the pot, along with the frozen peas. Remove the bay leaf and give the soup a good stir. Don't have some of the vegetables on hand? Get creative! Use mushrooms, zucchini, bell peppers, etc.